I galloped wildly across the Kryrgyzstan plain on horseback, with my hair fanning out behind me. Ok, I might not have quite meant the horse to gallop, a canter would have been sufficient, and my hair might have been tied back. 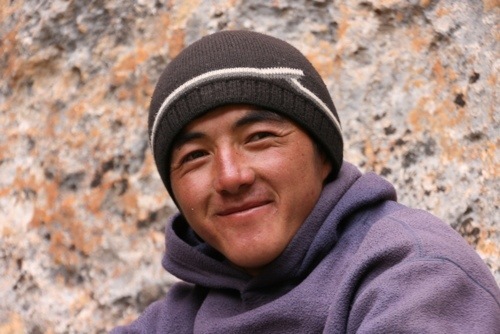 But nevertheless, I felt like a hero out of a Wild West film… or Chinggis Khan himself. 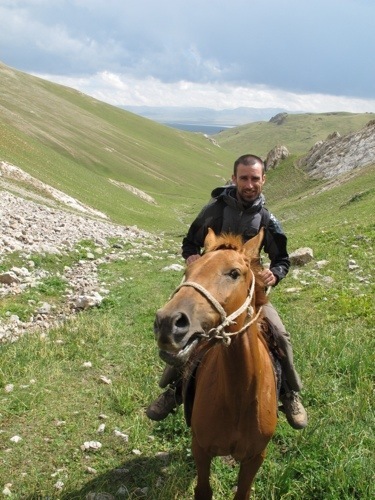 I had been talking about going horse riding in Kyrgyzstan for weeks, months, maybe even years. As soon as I discovered that I was visiting Kyrgyzstan I opened our big coffee table book on the world (it has a double spread on every country, and is great) and saw a massive picture of a nomad on horseback. Horse riding was the ‘must do’ attraction of the country, it added. There was lots of squealing and exclamations at the time, shortly followed by a commitment to have some horse riding lessons before we left the UK as I haven’t ridden since I was about 12. Matty, who has been on a pony once, was less than convinced. But somewhere in between trying to rent our house, get ready for the trip and buy travel insurance we forgot about the horse riding lessons. 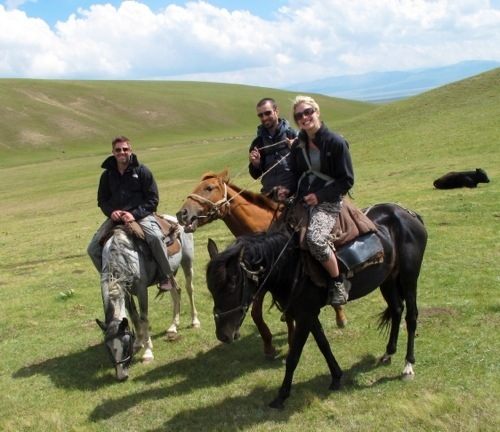 And so it was that the three of us found ourselves travelling to Lake Song-Kul in Kyrgyzstan to go horse riding with no real clue of what we were in for. 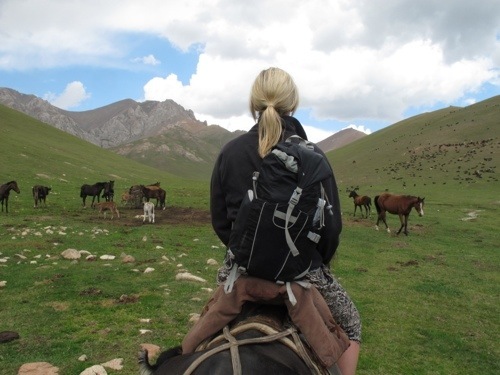 We reached our yurt, threw down our bags and ran out to meet the horses. Matty mentioned something about them having seen better days but they looked beautiful to me. There were three horses. “And a guide?” I tentatively asked. “Guide? 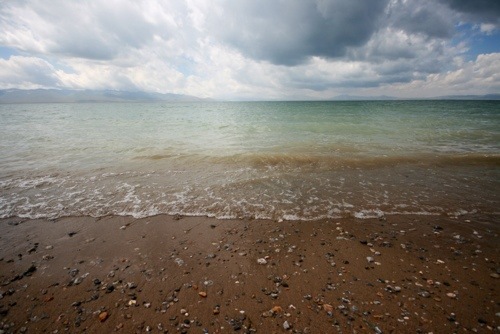 !” the smiling man before me with wind-burnt cheeks asked, somewhat amused by the request. “1,200 COM,” he added. “Yes, yes, fine”, I said, dreading to think what the consequences of horse riding would be without a guide after almost 18 years out of the saddle. He galloped into the distance and returned with a fourth horse for himself. We were each gruffly shown to our horses. I gave mine, a pretty black mare, a good nose stroke and flank pet before mounting her, to help with the bonding you see. Mongoose got on board his large, chestnut horse and Matty, funnily enough, was given a little grey horse that was the smallest of them all. And off we set. The reins were ropes, the stirrups were odd lengths and the saddle was covered in a big rug but it immediately felt natural to be back on a horse. Within minutes the Mongoose galloped past me clutching onto his saddle for dear life. His horse galloped off to the right in circles while our guide tried to bring it to a halt. Meanwhile Matty’s little horse was refusing to even move. Kicking as hard as he could and shouting: “Chou” at it, which is the command for go faster, the horse refused to move. Having brought the Mongoose’s horse to a halt, our guide galloped back to Matty with his whip in hand. We broke into a trot and I soon rediscovered the old “rise and sit” rhythm, and then a few kicks later, we were cantering across the plains. Past grazing cows and dozens of wild horses, through the valley and along the river. It was exhilarating. I presumed we were all having an equally fabulous time until we saw the Mongoose pull hard on his reins, rearing the horse’s head right back and shouting: “When I tell you to stop, you stop you stupid f**king nag,” in the most stern voice I’ve heard him use… Ever. They were not getting on well. After an hour and a half we stopped at a waterfall and stretched our cramped muscles that we felt like we were using for the first time. And then it was time to head back. The horses, seemingly knowing they were on their way home, were even more spritely than the first leg of the journey. 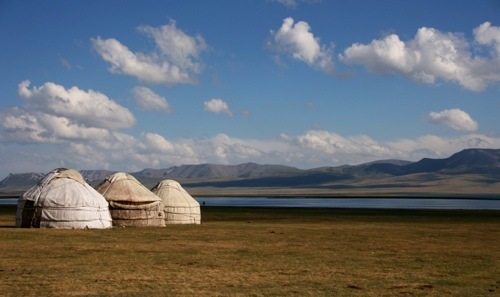 It was when the yurts and lake were once again in sight that my horse began galloping across the plains. It felt incredibly fast but strangely safe and wonderfully exhilarating. Luckily, my horse was responsive so a small tug on the reins pulled her back into a canter and trot. Matty was experiencing a similar elation – when suddenly he felt his saddle slipping and found himself falling, in his seat, down the side of the horse. Fortunately the horse slowed down as he tumbled off unhurt, before getting right back into the saddle to finish the ride. Meanwhile the Mongoose was seen cursing violently at his “nag” that would either refuse to move or refuse to travel slower than a gallop. He dismounted and declared a hatred of all horses. It was far from perfect – a combination of stirrups on ropes, wearing three quarter length trousers and no riding boots left the sides of my calves red raw with a sizeable amount of skin missing. But I can honestly say it was one of the most magical and exhilarating moments of the trip so far. That night, as we snuggled down beneath multiple quilts in our yurt, we decided to watch Django Unchained on our tablet. Set in the Wild West in slavery days, I watched in awe as Jamie Foxx galloped across the dusty land, with his gun in his holster and head framed by an oversized cowboy hat. That’s what I looked like, I told myself. Kind of. 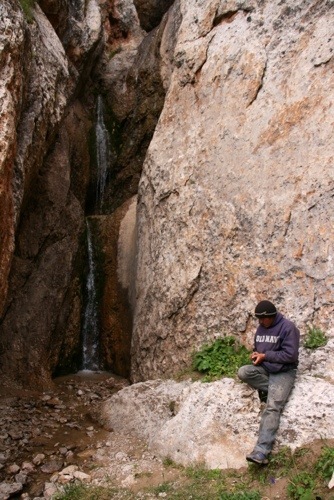 We travelled to Lake Song-Kol from Kochkor, Karakol. 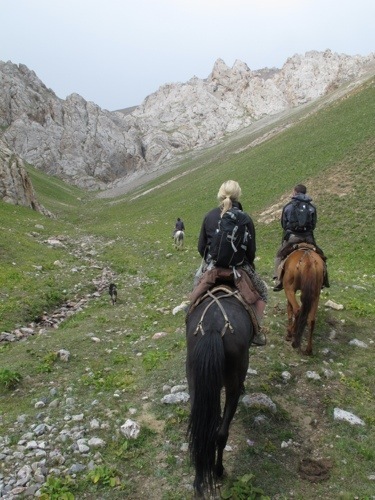 We arranged it through the CBT in Kochkor – a return taxi (taking three hours each way), and a yurt stay with dinner and breakfast cost 6,000 COM (about £80) between us. 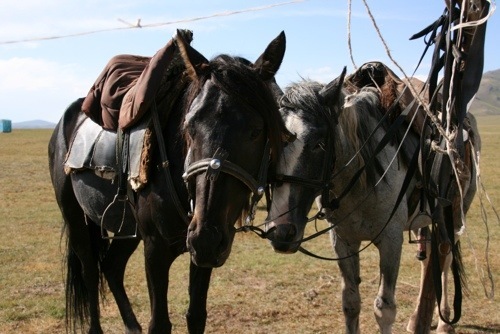 The horse riding is arranged by locals around the lake but the CBT told our driver to help find us good horses. It costs 200 COM per hour (about £3), you have to pay an additional 400 COM per hour for a guide on horseback. 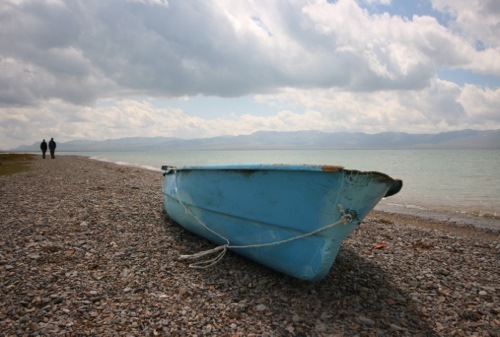 Wait–hold the phone–on top of everything else, Kyrgyzstan also has beaches? I’m floored.